Welcome to the Videolesson Schedule Page. 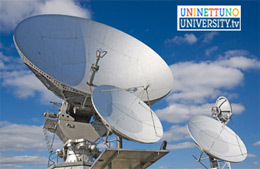 On this page you will be able to consult the television programming of channel broadcast via satellite, dedicated to International Telematic University Uninettuno. Our lessons can be watched free on channel 812 of the SKY platform and on the channel 701 of the Tivùsat platform. On this page you can have access to the pages of the Programme Schedule. by clicking here, you can have access to today’s complete schedule, surf to look at the schedule of the following and previous days and have access to the past and future programme schedules related to that channel.